Sunny lives in Nigeria, but she was born in New York City. She looks West African, but is so sensitive to the sun (due to her albinism) that she can’t play soccer during the day. She doesn’t seem to fit in anywhere. I’ve got a private rule, these days, that any book that is marketed more on the strength of the author’s skin colour (or anything else) rather than the story itself is to be regarded with extreme suspicion. Fundamentally, I don’t care about who the author is; I don’t care about the colour of their skin, their sexual orientation, their politics or anything else that might be used to draw lines between one group of humans and another. All I ask, when it comes to fiction, is that the author entertains me. 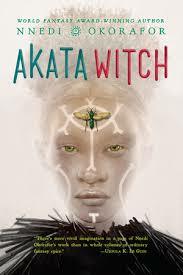 I first heard of Akata Witch through a discussion of non-white authors and that, I have to admit, soured me on the book. There is something wrong in judging an author – or anyone – by the colour of her skin. And that is a shame, for when I finally read Akata Witch I found myself quite impressed. 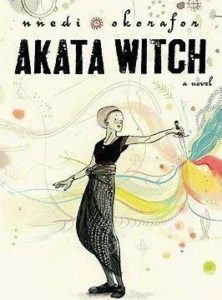 Akata Witch is focused on a girl called Sunny, who has moved from the United States back to her mother’s native Nigeria. Sunny is an albino, even though her father is African-American, something that has limited her life in both countries. (She can’t go out in the sun.) And then, when she meets three good friends, she discovers that she is a ‘free agent,’ a person with magical powers who can enter a secret magical community. She starts training, learning the ways of the community – sometimes kind, sometimes very harsh – and is eventually plunged into a battle against a supernatural serial killer, the Black Hat. It’s easy to see why some readers have called this book the Nigerian Harry Potter. It has some things in common, from the heroine learning magic to her unfortunate home life (her father is abusive and her mother isn’t much better) and the heroine and her friends being somehow special, compared to the other magicians. It also has many differences; it focuses on a more traditional way of learning magic, flavoured with a very different society, than Harry Potter’s focus on boarding school. Sunny herself is a very likeable character, far more likable – in some ways – than Harry Potter or Hermione Granger. She’s certainly a lot more inquisitive than Harry, being more willing to focus on learning magic than anything else; she’s also more willing to stand up for herself, something that nearly gets her into very real trouble once or twice. I don’t blame her, but I don’t blame her teachers for being alarmed too. Their world is more honourable, in many ways, than the Wizarding World of Harry Potter. Her friends are fun characters, although I wish we’d spent more time with them; her parents and brothers are a mixed bag, with her father’s abusive nature contrasted oddly with her mother’s silence, until she realised that Sunny is following in the footsteps of her grandmother. There’s a nice little moment, at the end, when she gives Sunny her grandmother’s legacy. It’s the sort of thing that Petunia Dursley should have done. Nnedi Okorafor does an excellent job of evoking a very different culture, although she doesn’t play this up as much as Rowling when she introduces Harry to the Wizarding World and Hogwarts. In some ways, this is both a strength and a weakness; we are introduced to the world along with Sunny herself, but – at the same time – many readers lack the background to fully understand the new world. (Rowling had the advantage that her readers would understand a boarding school even if they’d never attended one.) The book’s Nigeria is far more than just a stereotypical African country, although one reviewer claimed that Okorafor wasn’t talking about the real Nigeria. There are, however, aspects of the wild and wonderful magical world that are never explained. Money appears from nowhere, it seems, when an achievement is unlocked. There’s something neat about knowledge being rewarded, but it would be nice to know why. That said, the book does have its weaknesses. It starts to drag a little in the middle, a problem that nearly made me give up before I decided to see it through. While we hear about the Black Hat long before the kids are pushed into battle, a battle they are ill-prepared for, the final engagement is rushed badly. There are hints that the force behind the Black Hat will return – and Okorafor has already written the sequel, which I will look up at some point – but it feels, very much, as though she simply ran out of time. Akata Witch should have been longer. The author also takes a few swipes at the United States that seem a little unnecessary, given that the book is set in Nigeria. Forced social commentary is somewhat irritating.